Membership is open to all Christians. Church active since 2012. Most activities are held in English and Bahasa Indonesia. Sunday Service (12:30 pm) held at Jalan Diponegoro 24, Surabaya. 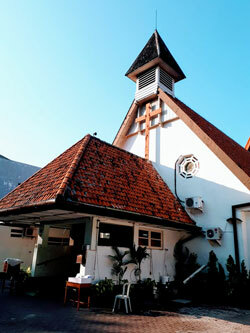 CCS envisions itself to be a center to provide pastoral care primarily to Anglicans and Episcopalians in Surabaya. We also reach out to the lost and disciple the faithful to glorify God in obedience to the Great Commandment and the Great Commission of our Lord Jesus Christ in the power of the Holy Spirit. We are affiliated under GSJA “Eben Haezer” Ambengan in Indonesia and Assemblies of God (ag.org). ICA is an inter-denominational fellowship. We consider ourselves an “inter-inter” group of people from all religious and ethnic backgrounds. Anyone is welcome to join us for worship. English mass is held every Sunday at 10.00 am.